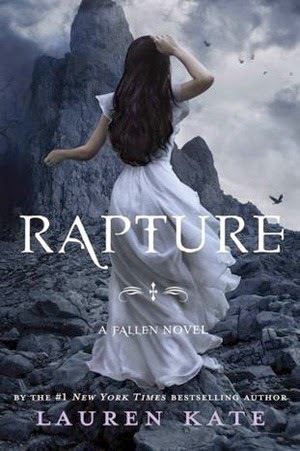 First Line: "First there was silence-"
Review: So I've finally finished this series, it took me two years after Rapture being released to finally pick it up and complete the series mainly because of how disappointed I was with Passion, anyways surprisingly Rapture did not disappoint and I now wish I did pick it up when it had first released. The books starts off exactly where it left off in Passion and even though it had been a while since I read Passion Kate gives you enough information to where it was easy to recall things that happened in the previous books. I did find myself a little bored at times but then certain things would occur that would grab my attention and I couldn't get through the pages fast enough and it continued like that for majority of the book everything is really fast paced and then all of a sudden for a few pages I found myself bored, but not to the point where it truly annoyed me and kept me from enjoying the book. I loved the amount of action and adventure that was delivered in Rapture although the battle I expected at the fall site didn't live up to what I had hoped for at all it was actually kind of a bummer. I do have to say it was finally nice to learn everything about Luce and who she was I kind of had guessed it but was never really sure and then there was her insane connection with Lucifer I just didn't see that coming at all. My biggest gripe about this whole book was the lack of Cam I adored him and it's like Kate just got tired of his character and barely made him relevant and then the lack of closure at the end with his character truly pissed me off. Speaking of endings I'm still trying to convince myself that I should be happy the way things played out for Luce and Daniel but I'm kind of sad and happy about it and after I finished reading it for about a day I was sitting there trying to convince myself all the reasons it was a good thing on how it all wrapped up for the two. Overall this series was a hit and miss some books were great others not so much but I'm glad I read it. Memorable Quotes:~"Heartbreak is its own form of amnesia." ~"You are the soul that fits into mine"